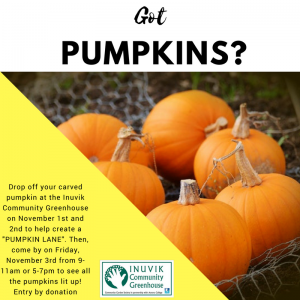 Help reduce your organic wastes, create soil, and support the Inuvik Community Greenhouse! How does it work? We will come collect your organic waste once a week, every two weeks or once a month – you decide. You will get a reminder email on Monday to tell you to put your compost outside on Tuesday morning. You choose how – a bag, box or container. If you want the container returned, just put your name/address on the outside and we will rinse and return it. 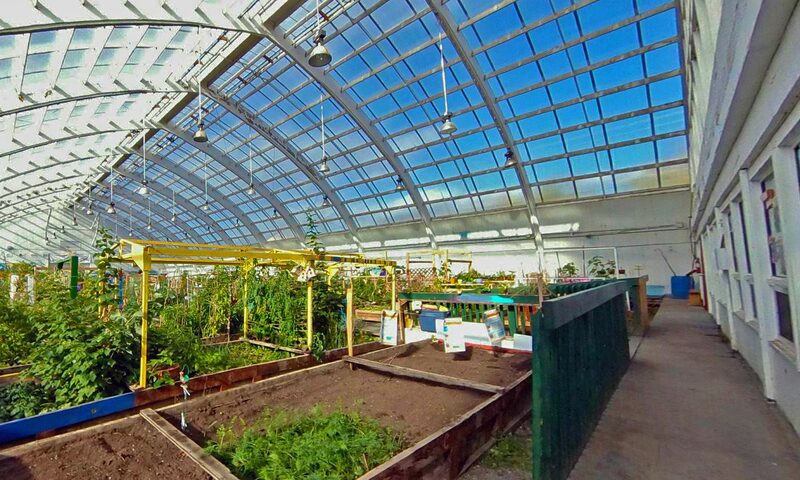 Any organic material (except meat, oil or animal waste) generally can be composted. You have the choice of weekly, biweekly or monthly. Biweekly is our recommended amount. 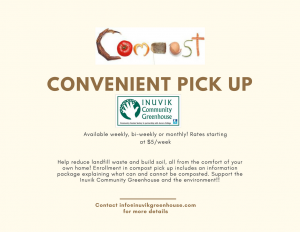 Contact us for more information or to sign up at info@inuvikgreenhouse.com !! Drop off your pumpkin this week to create a magical “Pumpkin Alley” in the greenhouse. Come by on Friday from 9-11am or 5-7pm to vote for your favourite! Winning pumpkin will receive a 1st place ribbon and $25! Entry to Greenhouse to view pumpkins by donation! For those dropping off pumpkins, please write your name and number on the bottom! As no one is on site, pumpkins can be left in the entry way.